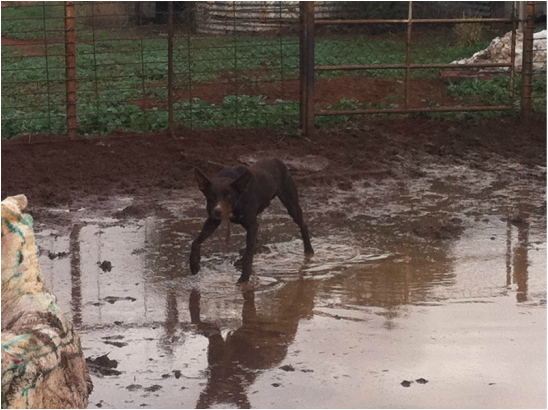 Boots is one of the best dogs we have bred working sheep, cattle and goats. He is a very smart dog that works all day and won't give up. He is the best backing dog I've seen on sheep and also backs cattle in the yards. He can work 3 sheep or 1000 and is very good on cattle biting very hard on nose and heel. Gully is a big stylish dog with good eye, calm strong dog with good holding ability and force when needed. Also backs in yards. Works sheep, cattle and goats. Can work 3 or 1000 sheep with ease. Very good on cattle, working weaners, cows and calves, biting on nose when needed. Gully is our main dog for mustering feral goats.